Until now, the ability to securely execute peer-to-peer trades of digital tokens that Switcheo cannot form a market for has been sorely lacking. We are therefore pleased to announce Switcheo OTC — a new crypto-to-crypto over-the-counter trading platform launching soon. To encourage traders to try the platform out, all OTC trades will enjoy 0% trading fees for the first month. After which, traders can opt to use SWTH tokens for discounts on fees. 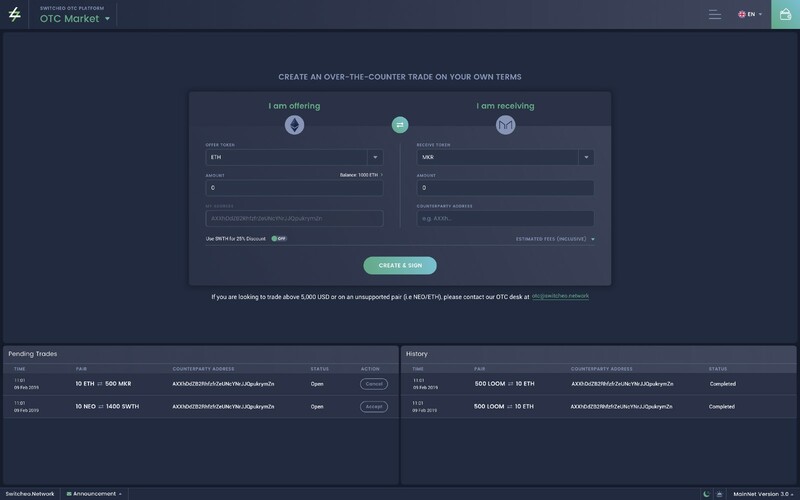 Similar to our main exchange, Switcheo OTC is also a fully non-custodial platform that executes trades immediately and transparently. The tokens used in Switcheo OTC also draw from the same smart contract balance as the main Exchange, giving traders a frictionless experience. Switcheo OTC will first launch with a limited set of tokens and be restricted to trading within individual blockchains. After our NEO V3 smart contract update, we will expand this offering to all compatible ERC-20 and NEP-5 tokens, including those that are not on the main Switcheo order books. Finally, cross-chain OTC trades will be enabled following the launch of atomic swap capabilities. We hope that Switcheo OTC will become a useful tool for cryptocurrency owners that need to execute large trades off the main order books, or need to execute peer-to-peer trades of tokens that are not listed on Switcheo’s markets. These type of trades can finally be done without compromising security through Switcheo OTC, as there is no middleman custodian involved and there is no risk of the counter-party not delivering tokens on their end of the trade. Stay tuned for the public beta of Switcheo OTC that will come to you on 4th March 2019! Switcheo’s public beta is live. Visit the public beta site now! Please note that Switcheo OTC does not conduct KYC on behalf of users and acts only as a trustless escrow. Users must agree to conduct their own due diligence and should ensure that they can legally buy or sell the tokens that they are trading. Switcheo OTC will not be acting as a broker for OTC trades and does not conduct matching services on behalf of the user. However, Switcheo has a traditional OTC trading desk for this purpose — read on for more. Traders looking for counter-parties to buy or sell large quantities of digital tokens from, or wishes to trade on a currently unsupported pair (such as NEO/ETH) can contact our OTC trading desk at otc@switcheo.network. Switcheo’s OTC desk is able to connect traders to our established network of token partners, market makers and institutional investors. The minimum ticket size for this service is USD5000.